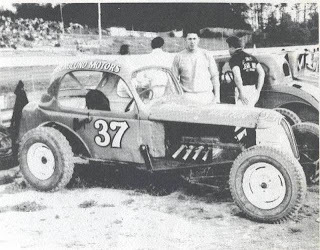 Because the BCTRA had pulled out of Langley at the start of the 1966 other modifieds were enlisted to race. Mostly it was the dirt track modifieds from Skagit Speedway. Rick Lester got a roll over trophy. Also running that day: Waly Madden and Carmen Parton. Parton hit the outside wall in one race narrowly missing starter Leo Vanderkamp. Top photo I doubt is of the accident in question as Carman's early-late is on the inside. But Leo and Bob Desormeaux are in the starter area watching it all unfold. Photo courtesy of Barry Youngston. The photo below I believe is Lloyd Armey. It also looks like Langley. So..., is it? A couple photos I took at the street show last Sunday. Featured a couple hours indoors (good, because a downpour happened around the same time) with the Digney Speedway reunion. Unfortunately I was too busy to take photos of those who attended but those there included Larry McBride, Les and Bill Diack, Gim Wong, Brent Anderton, and Ernie (Dig) and Joyce Digney and many others. This coming weekend is a big nostalgia race at Mission Raceway Park by the Langley Loafers. Check out this site for more info. And just to prove that "go green" is more than on the Christmas tree here's an interesting looking race car. Wonder about the aerodynamics. More air, more green leafy stuff I suppose. Lang Armstrong, a Canadian I believe from Alberta, did some art for the Vancouver News-Herald in 1941. The midget cars were still running at Con Jones Park in east Vancouver so he did a few racing themed panels for his "The Sporting Thing". At one point I had a link to info on Lang but that seems to be lost in the internet ether for the moment. The News-Herald rose during the hard times of the mid-1930s and lasted into the 1950s. Top is a photo I took of him being photographed by the guy at the starting line last May at the Knox Mountain Hill Climb. I know I'm missing information between 1907 and 1912. Just haven't looked hard enough. Oh well, a future research project. And an update for the blog. Minoru Park in Richmond still exists, but the one-mile horse track doesn't. Of interest is that the promoter is Con Jones, a tobacconist from Australia, who got professional field lacrosse going in Vancouver for a short while. He built a playing field called Con Jones Park (what is now Callister Park). From 1939 to 1941 midgets and motorcycles raced there. And Harry Hooper's name will show up in other racing information in the future. Vancouver's first taxi cab driver Harry was a self-promoter and one of Vancouver's characters. Abbotsford Airport. After the BC Custom Car Association was formed they began using the airport, as did the Sports Car Club of BC, for racing. Have to make these things short and sweet as "the job" is pressing. Or depressing. Trying to get some display material ready for a show and shine at the Spirt of Edmonds car show. The focus is on Digney Speedway which opened in 1948 and closed at the end of the 1958 season. A.C. "Andy" Digney was the owner for the first years, until he sold the land and the BC Stock Car Racing Association ran it until the land was finally taken for business purpose uses. Lots of opinions on Andy. Good guy, bad guy. He made things happen. Message from Ralph Monhay that Doug Larson, Quesnel, BC, 4 time CAMRA champion, passed away yesterday from a heart attack. I believe he was 62 years old judging from the attached clipping from the 1977 Open Wheel yearbook. A few years ago, when CASCAR first appeared as part of the Molson Indy weekend, I spoke briefly with his son, Ron, about his dad. Nothing too important except that I knew who he was and what he'd accomplished. Not sure if this is the last time the midgets ran in the lower mainland (not including the quarter-midgets which still run in Aldergrove). Ed Shefchik (Puyallup, WA) won the A dash. Consolation main was won by A.C. Stebbins (Kent, WA), second was Bill Hall (Burnaby) and third Gary Ekland (Federal Way, WA). The A main was won by Ed Shefchik with Munce second and Chuck Rude (Lynwood, WA) third. Support class was the claimers. A main winner was Bjorn Illingby followed by Chuck Swanson and Gary Rayburn. Consy winner was Al Darbyshire. B main was Don White. All info from the Columbian. Al Adams of Seattle had the bad wreck. From the newspaper: "Adams spun in the first turn, rolled three times and in the process, his cage gave way and officials spent 20 minutes extricating the American from his car. He was sent to hospital with suspected broken ribs, lacerated cheek and concussion." Photo below is of winner Ed Shefchik. Both photos come from the Bill Hall family collection. Thanks Rob. A new set of stats, etc. This time from 1907 to 1931, mostly Vancouver with some Victoria stuff thrown in as well. All pulled from the microfilm morgues of various libraries. --3-lap novelty: standing start with a load of passengers, dropping them off after a lap, running a lap alone, then picking them up for the last lap. --Class A, novelty: cars started with a full complement of passengers and at the end of one lap the driver was obliged to jump out and open the door and let the passengers off, then proceed through lap two alone, stop again at the start of lap three and pick up the passengers. --stopped due to Virgil Hall accident. Franklin Spiders, Thomas Flyers, and, geez, a Wayne steamer. Hadn't remembered that from my original research. Lots of good stories came from those two races. I'll have to elaborate on a couple in future posts. I did write a story on the races many years back in The Alternate. Not sure of the issue number at the moment. Last week's Langley Speedway race review from 1966 featured the midgets from Washington State. 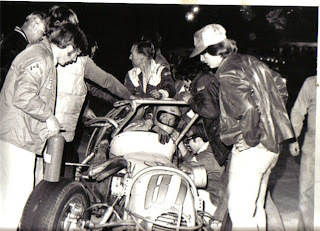 Over the years the midgets were a major driving force in developing motorsport in the Greater Vancouver area. At Con Jones Park as the Second World War began, at various tracks after the war, encouraging Andy Digney to build Digney Speedway in Burnaby, the BCMARA built False Creek Speedway, and finally into the 1960s and 70s at Langley Speedway. So on July 19th, 2008 the midgets of the WMRA are scheduled to return to the lower mainland, Agassiz Speedway to be specific. First time in, what?, 30 years? 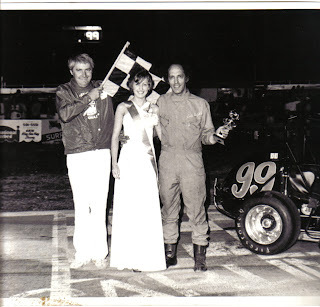 The clipping on top features a win by Mel McGoughy followed by Don Olds, Shorty Templeman and Lew Florence. Clark "Shorty" Templeman is a legend in the history of midget racing and it's interesting to note that the 1966 Langley midget results included his son Clark. I received a letter from wife and mother, Mary Templeman, who, due to the fatal accidents to both husband and son, knew more about the high cost of racing. Apparently she was originally from Langley Prairie, BC. Bob "Craig" Gregg raced for decades coming to Langley and winning a CAMRA race in 1967. Ed Kostenuk ran USAC for a few years. Bob Henry started Van-Kam Trucking. And Lew Florence went onto sports car racing coming up to Westwood numerous times. Lots of history with the midgets. An anniversary date just passed. Others noted that July 11, 1971 marked the day of Pedro Rodriguez' fatal accident. I can't keep track of dates like that. Glad others can. The talk concerning Pedro was if he had raced in the Pacific northwest. He had. He won a major race at Kent, WA in 1963. And he was scheduled to at least do a demonstration lap at Westwood in 1965 following the Shell 4000 rally. Go to the Shell 4000 site for more info. So, a couple bits from Competition Press about Pedro's win. Interesting to note in the dnf column some drivers from Westwood: Bill Stephens in a Lister, Jim Rattenbury in a Porsche and John Razzelle in a Cobra. Information from the Columbian, Province and Langley Advance newspapers. 5500 in attendance. 22 midgets from the Washington Midget Racing Association. A main for the midgets, 30-laps, won by Ken Peterson, Seattle, powered by an Offy. B main for the midgets, 20-laps (? ), won by Clark Templeman, Seattle. A heat for the midgets: 1, Peterson; 2, John McIntire; 3, Cliff Spaudling. B heat for the midgets: 1, Clark Templeman; 2nd, Cliff Spaulding. Also ran in the midget class: Barry Hampton (apparently a New Zealand champion), #44 Harlem Zentpher, #97 Johnnny Woods, #7 Todd Pinkham and local driver Bill Hall. The early-late class also raced that day. Bit unclear about main event winners. One newspaper has Les Spratt winning the 25-lap main driving a 1954 Ford followed by Carmen Parton in a 1951 Chev. Another has the last race for the early-lates won by Jack Martin, followed by Dennis Corfe. Lots to be said about John Hall. He raced for a number of years at Westwood and other places. I don't have a good bio done for him but this bit of info from the Edmonton Journal shows him racing his Mustang with the Trans-Am series in 1971. Had a bit of a fire in the pits which got everybody's attention. Interesting drag racing photo from the Prince George Citizen. The drag races run by the Northern Interior Timed Racing Organization (NITRO, hey clever!) were held 30 miles east of PG on the highway to Vanderhoof. Not sure if the road was closed or there was a side road used. But the starter looks like he is doing it the way the guy on Pinks (Speed t.v.) does it so I guess the guy on Pinks is doing it right. I was never sure. I know, very slow on this. I've read some chatter about folks from north of the 49th parallel heading south for this weekend. The price of fuel isn't an obstacle. Good for them. Big confession. I've never gone to Pacific Raceways in any of its name incarnations: Seattle International Raceway, Kent or Pacific. Someday I'll rectify that. Maybe when the price of fuel goes down. Here's a 1961 clipping for a race there. Features some info on Canadian racer Arleigh Pilkey whose racing credentials went back to the teens. He was the elder statesman of racing at that point with a couple more years of racing left in him even in 1961.